LOS ANGELES–(BUSINESS WIRE)–For the 19th year in a row, The Tailgate Tour returns back to the road reaching college football fans across the country with an interactive experience that features great consumer brand trial, music, skills challenges highlighted with top media. 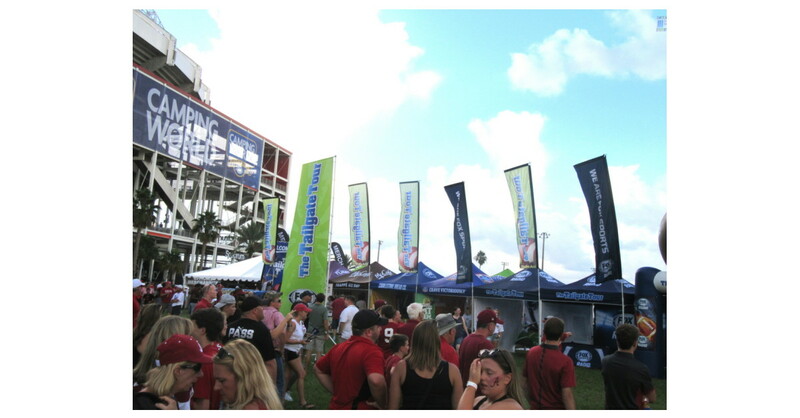 The 2018 presentation of The Tailgate Tour started September 1st at the Camping World Kickoff classic featuring #1 Alabama and will celebrate with fans to the backdrop of some of the largest games in the country. With close to 20 years on the road, the program continues to be the nation’s longest running and largest college football fan experience at events and online. The tour welcomes back long time media partner Fox Sports Radio (Iheartmedia), Meredith Communication’s Rachael Ray Everyday, Tailgater Monthly and a host of regional sports outlets and affiliates. The 2018 program will showcase some of the largest brands in the categories of Beverage, CPG, OTC, Hospitality, Major Retail, Grilling and Personal Care to include: Coca-Cola’s McCafe Frappe, Blue Diamond Almonds, GlaxoSmithKline Tums, Cholula Hot Sauce, Cobblestone Bread & Nathans Hotdogs to name a few. The tour had an overall reach of over 1.5 million consumers at events and total reach across assets exceeding 13 million in 2017. With so much experience, NFuse 360 Marketing continues to increase the pairing of social, digital, print, broadcast, experiential, outdoor driving measureable results. The Tailgate Tour has reached over 30 million fans since its conception. The Tour will visit teams from around the SEC, BIG 10, BIG 12 and the ACC conferences including marquee events University of Florida vs. University of Georgia annual match up in Jacksonville and The ACC Championship through a partnership with Raycom Sports. “The Tailgate Tour has reached over 30 million fans since its conception. The combination of our brand power and our partners have made this programs performance evergreen in the mind of consumers,” said Freedman. Complete details on all dates and activities related to the tour to be showcased at www.tailgatetour.com and on Facebook (www.facebook.com/thetailgatetour). Local partners on The Tailgate Tour include a long list of local radio stations, online and newspapers. NFuse 360 Marketing is based in Florida with regional offices in Nashville and Westlake Village, CA. NFuse 360 Marketing is a strategic integrated Marketing, Promotion and Events company that directs an array of custom marketing programs for Radio, TV and Brands. NFuse 360 builds hundreds of custom programs a year that are structured on providing 360 degrees solutions for its clients.